If you have decided to venture into the exciting world of DIY publishing there may be a few things about traditional formatting you are unaware of. We all want our books to look professional when they’re printed but we might not have the money to spend on a formatting editor or typesetter. We barter and trade skills with colleagues whenever possible, but sometimes our connections are limited and the onus is on us. Most of us publishing aspirants have either never heard of this term before or have heard it but not understood it. There are rules the big publishers follow regarding where a paragraph begins and ends on a page. Orphans are the last line of a paragraph left all alone at the top of the next page. You will never see this in a traditional, professional publication of a novel and it should be avoided (this is why some pages look as if they have more blank space at the bottom than the next one). If you can’t get around the lost line by re-formatting the paragraphs on the previous page you may have to knuckle down and do a bit of re-writing to tighten this area up. 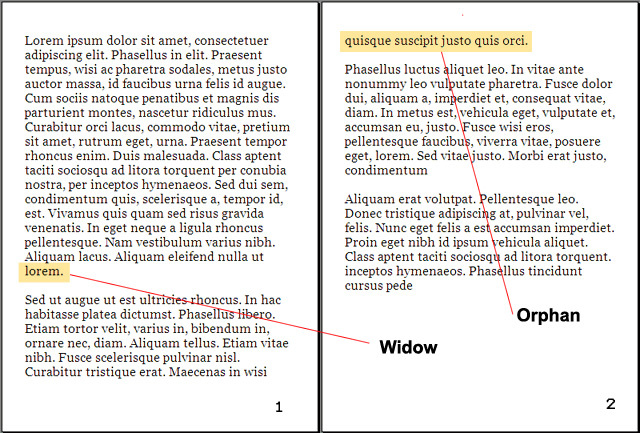 Widows are the last word in a paragraph on a line by itself. The rule of thumb here is that if the word left all alone is at least 5 characters long, it’s grown-up enough to be by itself. However, if the word is less than 5 characters it is too small to go gallivanting around on a line without supervision. In this instance you may need to add a word or two to realign the paragraph, or tighten to allow for the small last word to slide up to the line above. That being said, many typesetters will advise you to re-work the paragraph to eliminate the lonely word altogether, regardless of its length. It may seem a little ridiculous and overly nit-picky but if you want your print book to be taken seriously and play with the big-boys this bit of typesetting will visually set your work above the amateurs. I had not heard of Widows and Orphans before (in this context). As a reader I never noticed publisher were doing this, but now that you made me stop and think about it, I can see it now. Thanks for the tip. If I end up going the self-published route, I’m sure there will be many more tips I’ll need.